Just wanted to send a quick shout-out to all our retailers and customers in Canada. Glad to know so many people are having a good time with the game Stumblebum. The winters must get pretty cold up there. Even colder I imagine than in Minnesota. It’s always nice to warm-up with a good game and a group of friends or family. A big THANK YOU goes out to all our Stumblebum® customers and retailers. 2009 was another great year for the game. As has been the case each year since the game was introduced on a limited basis a few years ago, Stumblebum sold out in 2009. In fact, inventory dried up even earlier than expected during this past holiday season and we were actually unable to supply games to some of our retail partners. Although I am extremely pleased with the reception Stumblebum continues to garner (anyone that’s played the game knows it’s great fun), I apologize for not being able to fulfill every order. With virtually no Stumblebum inventory to speak of, Big E Toys is provided a unique opportunity to do some very special things in 2010. In addition to a redesign of the Stumblebum box, plans are being developed for a unique charitable program to be launched in the coming months. Stay tuned. These days, everybody can use a little fun in their lives. And what could be more fun than having a few laughs with friends or family? 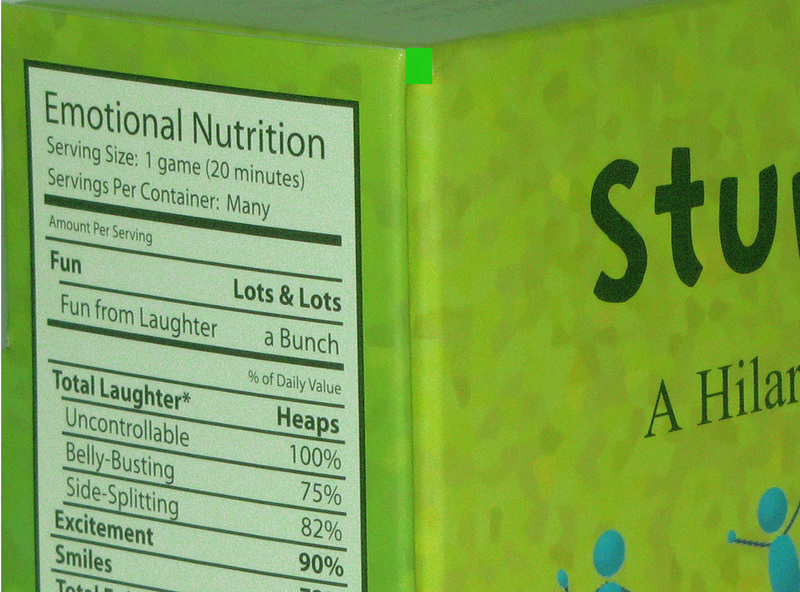 Take a look at the new Emotional Nutrition label on the charades-based game Stumblebum and you might be surprised just how much fun and laughter can be packed into a little box. Of course, the Stumblebum Emotional Nutrition label can’t possibly reflect the actual fun and laughter any individual might derive from the game. But that’s not really the point. Studies have shown that laughter and humor can have a positive affect on our mental and physical lives. It seems so obvious, yet many of us don’t always make time for fun and laughter. Now is the time though. So get yourself a Stumblebum game today. And make sure to get a couple for your friends and family members. Stumblebum makes a great gift. Your lives will be better for it! BUY NOW!